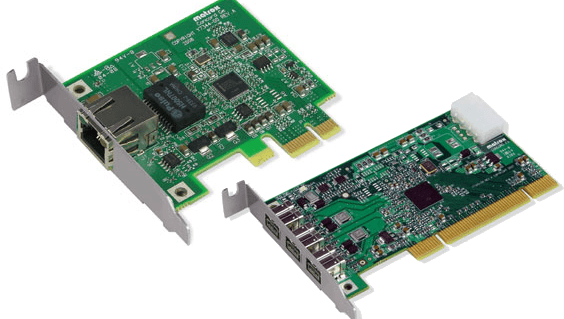 Matrox Concord is a family of Gigabit Ethernet network interface cards (NICs) and IEEE 1394b adaptors that are pre-licensed for use with the Matrox Imaging Library (MIL) drivers for the GigE Vision® and IEEE 1394 IIDC protocols. A versatile design enables Matrox Vio family to handle new high definition (HD) and traditional standard definition (SD) broadcast video formats transmitted over Serial Digital Interface (SDI) or analog form. In addition to video capture and display2, 3, 4 the Matrox Vio family provides graphics overlay capabilities and the ability to stream high-definition video to/from the host PC through a four lane (x4) PCI Express® (PCIe®) interface. The Matrox Concord G-series are Gigabit Ethernet NICs that provide optimum support for the GigE Vision® camera interface standard. By way of MIL, these NICs are optimally configured to minimize GigE Vision® protocol loading on the host through the default enabling of jumbo packets as well as optimal settings for the interrupt throttling rate and number of receive buffers. Unlike common NICs, using the Matrox Concord G-series with MIL does not require manually adjusting advanced driver properties. Auto medium-dependent interface crossover (MDIX) further simplifies setup by automatically detecting and crossing over signals for peer-to-peer connections thereby eliminating the need for special cables. The Matrox Concord F-series are IEEE 1394b adaptors that, through MIL, enable the use of leading IEEE 1394 industrial cameras implementing the standard IIDC protocol. These adaptors, by way of MIL, support up to the S400 and S8003 modes of IEEE 1394a and 1394b respectively, ensuring maximum camera performance and minimal transfer latency. In addition, the use of bilingual copper connectivity permits for cost-effective cabling. Matrox Concord boards are manufactured with strict change control to ensure a consistent supply through a long life cycle. Longevity of stable supply lets OEMs achieve maximum return on the original investment without incurring the additional costs associated with qualifying new boards.